#Raven Feathered Stag #Does this make Hannibal a Baratheon? #Or Will? (nbchannibal@tumblr) Yup, that was a Game of Thrones joke. I love you, NBCHannibal tumblr. This is, in many ways, an open letter of devotion to the NBC Hannibal Tumblr administrator. But in other respects, it’s a look into how television shows and networks are tapping into some of the gold mines of the internet that were rather undiscovered. If you haven’t been to the show’s official tumblr, check it out. Not only does it have some great gifs, and some of the loveliest fangirling I’ve ever seen, it is clearly run by someone who is, well… The only way to say it is that it is run by someone who is very familiar with tumblr. If you aren’t familiar with the secret world of tumblr tags, you either haven’t been paying attention or you’re just new to tumblr. But the world of tumblr tags is a nice place for someone to put all of their feeling comments into literal tag paragraphs or just spurts of raw emotion. Normally official social media sites don’t indulge in this practice, but NBC Hannibal does. And I love it. Hell, it’s the exact reason why I follow their tumblr at all. Other shows that have tumblrs don’t seem to utilize just how useful it is, and it’s refreshing to see them interacting with their fans. Not only does it let us know that they are paying attention to what we are saying but it also lets the fans know that they care. Although there are other tumblrs out there for shows, like Fox’s Bones or USA’s Suits, they lack the kind of execution that Hannibal’s seems to provide. Both lacking in original content and connection to their fans. The only time I have seen something similar is in Fox’s The Following. While not on the same notes as Hannibal, they utilized tumblr in the same sort of way. Using it to promote their television show as well as reach out to their existing fandom, with some pretty funny tag comments and some awesomely scary content. They did the same on twitter, by creating a personal fictional twitter for Joe Carroll. I am mentioning all of this Following stuff because I have yet to see an interview with NBC’s Hannibal social media group about their tumblr, but I am both impressed and pleased by how they have been able to harness the power of Tumblr. Seeing as Hannibal has quickly become one of the largest fandoms in tumblr, as a nerd, I can’t very well ignore how much their official page seems to be feeding to the flames. Seeing networks reach out to the fans, when for a long time the fan experience was a separate entity within itself, creating bridges between them and their viewers is a creative and exciting direction to see them going. AMAs on Reddit, fangirl freakouts on Tumblr, they all contribute to the life of a show. For once, it’s not just about viewership. Fans have a direct door to the networks about the show. So to end this longwinded letter, I just want to say, whoever you are, managing this tumblr, you are the light of my life and will keep me warm until we get some more Hannibal next spring! Whoever you are Hannibal tumblr manager(s) you definitely made every day as a Fannibal so much more enjoyable. I hope they keep us all updated as season two moves into production and just generally hang out and fangirl over the next year. Can we message the NBCHannibal tumblr account and see if their social media person wants to do an interview? 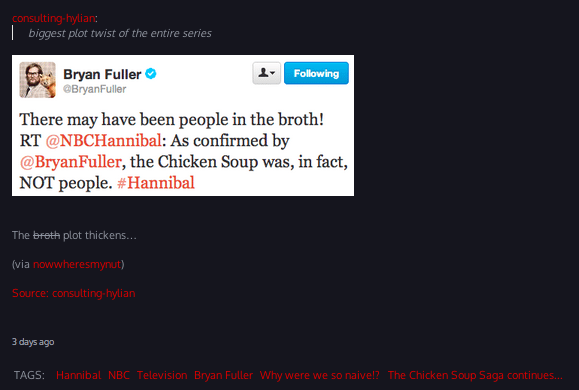 Because…lets be honest I just want to talk to the people behind the Hannibal Tumblr ’cause it is freaking hilarious.